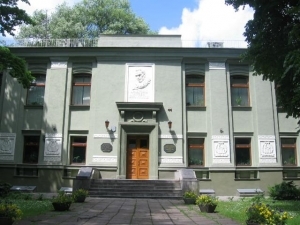 Yanka Kupala's museum is located in one of the most beautiful areas of the capital of Belarus. Having changed several places since foundation, it was finally established on the site where the original house of the poet stood, demolished with the fascist bombs in the first days of the World War II. Together with the grand monument to the poet and the fountain called «Kupalye» (bathing), the museum fits into a solid harmonious ensemble. Yanka Kupala (1882 — 1942) was a classic of Belarusian literature: a poet, playwright, translator, author of about 2,000 works that were translated into many foreign languages. Together with Yakub Kolas, he was a founder of a new Belarusian literature. In his poems lyricism and melodiousness of traditional songs harmonized with the achievements of the soviet literature. The museum of this national genius, being one of the oldest literary museums of the Republic, was opened to the public in 1945. The creator of the museum was poet's wife Vladislava Frantzevna Lutzevich. Autographs, books, photographs, personal belongings were carefully collected by her and made a starting point for the museum's collections. The exhibition of the museum tells about the life of the genius writer and his works.